Not to be confused with coconut water. "Coconut cream" redirects here. For the dehydrated ground coconut pulp product, see creamed coconut. Coconut milk is an opaque milky white liquid extracted from the grated pulp of mature coconuts. The opacity and rich taste of coconut milk are due to its high oil content, most of which is saturated fat. Coconut milk is a traditional food ingredient used in Southeast Asia, Oceania, South Asia, and East Africa. It is also used for cooking in the Caribbean, tropical Latin America, and West Africa, where coconuts were introduced during the colonial era. Coconut milk is differentiated into subtypes based on fat content. They can be generalized to coconut cream (or thick coconut milk) with the highest amount of fat; coconut milk (or thin coconut milk) with a maximum of around 20% fat; and coconut skim milk with negligible amounts of fat. These terminologies are not always followed in commercial coconut milk sold in western countries. Coconut milk can also be used to produce milk substitutes (differentiated as "coconut milk beverages"). These products are not the same as regular coconut milk products which are meant for cooking, not drinking. A sweetened processed coconut milk product from Puerto Rico is also known as cream of coconut. It is used in many desserts and beverages like the piña colada, though it should not be confused with coconut cream. In a 100 milliliter (g) portion, coconut milk contains 230 kilocalories and is 68% water, 24% total fat, 6% carbohydrates, and 2% protein (see table). The fat composition includes 21 grams of saturated fat, half of which is lauric acid. Coconut milk is a rich source (20% or more of the Daily Value, DV) of manganese (44% DV) and an adequate source (10–19% DV) of phosphorus, iron, and magnesium, with no other nutrients in significant content (see table). Coconut milk is a relatively stable oil-in-water emulsion with proteins that act as emulsifiers and thickening agents. It is opaque and milky white in color and range in consistency from watery to creamy. Based on fat content, coconut milk is divided into different subtypes generally simplified to "coconut cream", "coconut milk", and "coconut skim milk", from highest to lowest respectively. Coconut milk and coconut cream (also called "thin coconut milk" and "thick coconut milk", respectively) are traditionally differentiated in countries where coconuts are native based on the stages of extraction. They are also differentiated in modern standards set by the Asian and Pacific Coconut Community (APCC) and the Food and Agriculture Organization of the United Nations (FAO). However, the terminologies are not always followed in commercial coconut milk (especially in western countries) because these standards are not mandatory. This can cause confusion among consumers. Coconut milk can also sometimes be confused with coconut water. Coconut water is the clear fluid found within the coconut seed, while coconut milk is the extracted liquid derived from the manual or mechanical crushing of coconut pulp. Coconut cream should also not be confused with creamed coconut, which is a semi-solid paste made from finely ground coconut pulp; and cream of coconut, which is a processed product made from heavily sweetened coconut cream. Coconut milk is traditionally made by grating the white inner flesh of mature coconuts and mixing the shredded coconut pulp with a small amount of hot water in order to suspend the fat present in the grated pulp. The grating process can be carried out manually or by machine. Coconut milk is also traditionally divided into two grades: coconut cream (or thick coconut milk) and thin coconut milk. Coconut cream contains around 20% to 50% fat; while thin coconut milk contains 5% to 20% fat. Coconut cream is extracted from the first pressings of grated coconut pulp directly through cheesecloth. Sometimes a small amount of hot water may also be added, but generally coconut cream is extracted with no added water. Thin coconut milk, on the other hand, is produced by the subsequent pressings after soaking the squeezed coconut pulp with hot water. Gravity separation can also be used to derive a top layer of coconut cream and a bottom layer of coconut skim milk. This is achieved by simply allowing the extracted liquid to stand for an hour. Conversely, coconut cream can be diluted into thinner coconut milk by simply adding water. Traditionally prepared coconut milk are utilized immediately after being freshly extracted because they spoil easily when exposed to air. They become rancid after a few hours at room temperatures of 28 to 30 °C (82 to 86 °F) due to lipid oxidation and lipolysis. Rancid coconut milk give off a strong unpleasant smell and have a distinctive soapy taste. Coconut cream contains a higher amount of soluble, suspended solids, which makes it a good ingredient for desserts and rich and dry sauces. Because thin milk contains a lesser amount of these soluble solids, it is mainly used in general cooking. The distinction between coconut cream and thin coconut milk is not usually made in western nations due to the fact that fresh coconut milk is uncommon in these countries and most consumers buy coconut milk in cartons or cans. Coconut milk is also an intermediate step in the traditional wet process methods of producing virgin coconut oil by gradual heating, churning, or fermentation. These methods, however, are less efficient than coconut oil production from copra. Manual coconut graters are a standard kitchen equipment in households in the tropical Asia-Pacific and Eastern Africa, underscoring the importance of coconut milk and coconut oil extraction in the Indo-Pacific. They reached as far as Polynesia before European contact via the Austronesian expansion. The basic design of coconut graters consist of a low bench or stool with a horizontal serrated disk (made of metal in Asia and Africa, and stone or shell in Oceania) attached on one end. 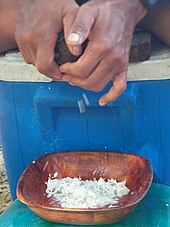 A person sits on the bench and repeatedly scrapes the inner surface of halved coconut shells with both hands over the metal disk. The scrapings are gathered by a container placed below. More modern coconut graters dating back to the mid-1800s consist of serrated blades with a hand crank. This version is believed to be a British invention. Commercially processed coconut milk products use largely the same processes to extract coconut milk from pulp, though they use more mechanical equipment like deshelling machines, grinders and pulverizers, motorized coconut shredders, and coconut milk extractors. They differ significantly in the bottling or canning process, however. Processed coconut milk are first filtered through a 100 mesh filters. They are pasteurized indirectly by double boiling at around 70 °C (158 °F), carefully not exceeding 80 °C (176 °F), the temperature at which coconut milk start to coagulate. After pasteurization, they are immediately transferred to filling vessels and sealed before being cooled down. They are then packed into bottles, cans, or pouches and blast frozen for storage and transport. Manufacturers of canned coconut milk typically combine diluted and comminuted milk with the addition of water as a filler. Depending on the brand and age of the milk itself, a thicker, more paste-like consistency floats to the top of the can (a gravity separation, similar to traditional methods), and is sometimes separated and used in recipes that require coconut cream rather than coconut milk. Some brands sold in Western countries undergo homogenization and add additional thickening agents and emulsifiers to prevent the milk from separating inside the can. Due to factors like pasteurization, minimal contact with oxygen, and additives like antioxidants, processed coconut milk generally has a longer shelf life than traditionally prepared coconut milk. 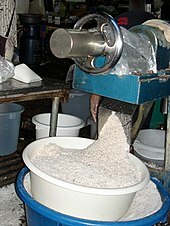 It is also more efficient than traditional methods at extracting the maximum amount of coconut milk from grated coconut. Coconut cream can be dehydrated into coconut milk powder which has a far longer shelf life. They are processed by adding maltodextrin and casein to coconut cream to improve fluidity and then spray drying the mixture. The powder is packaged in moisture-proof containers. To use, water is simply added to the coconut milk powder. Coconut skim milk is coconut milk with very low levels of fat (0% to 1.5%). It is a byproduct of coconut cream and coconut oil production and are usually discarded. However, they are increasingly being used as a food ingredient for products which require coconut flavoring without the fats (including coconut powder, coconut honey, and coconut jam). They can also be used as a base in the production of coconut milk beverages used as dairy milk substitutes, as they do not contain the high levels of fat characteristic of regular coconut milk while still being a good source of soluble proteins. Processed coconut milk can be used as substitutes for various dairy milk beverages, usually marketed as "coconut milk beverage". They are sometimes confusingly also simply labeled as "coconut milk", though they are not the same product as coconut milk used for cooking (which are not meant for drinking). Milk substitutes from coconut are basically coconut milk diluted with water or coconut skim milk with additives. They contain less fat and fewer calories than milk, but also has less proteins. They contain high amounts of potassium and are good sources of fiber and iron. They are also commonly fortified with vitamin D and calcium. Coconut milk are also used widely for filled milk products. They are blended with dairy milk (usually skim milk or powdered milk) for its vegetable oils and proteins which acts as a substitute for expensive butterfat in some processed milk products. They include low fat filled milk, evaporated reconstituted milk, and sweetened condensed milk. Coconut milk can also be used in cheese and custard production, substituting at most 50% of dairy milk without lowering the overall quality of the products. By mixing skim milk with coconut milk, one procedure developed cheeses, including a garlic-spiced soft cheese called queso de ajo, a Gouda cheese substitute, and a Roquefort substitute called "Niyoblue" (a portmanteau of Tagalog niyog, "coconut", and "blue"). Coconut milk can be used to enrich the fat content of soy milk, improving its texture and taste to be closer to that of real milk. Coconut cream can also be added to soy milk in the production of tofu to enrich its caloric density without affecting its palatability. Cream of coconut is a thick, heavily sweetened processed coconut milk product resembling condensed milk. It is originally produced by the Puerto Rican company Coco López and is used most notably in piña coladas in the United States. It can also be used for other cocktail drinks and various desserts. It should not be confused with or used as a substitute for coconut cream. In the Philippines, coconut milk can also be further processed into coconut caramel and coconut curds, both known as latik. The coconut caramel version of latik made from a reduction of muscovado sugar and coconut milk has been developed into a commercial product marketed as coconut syrup (not to be confused with coconut sugar derived from coconut sap). A similar product found throughout Southeast Asia is coconut jam. It is known as matamís sa báo in the Philippines and uses only coconut milk and sugar. However, the coconut jam versions from Indonesia, Malaysia, and Singapore (kaya); Thailand (sangkhaya); Cambodia (sankiah); and Vietnam (banh gan), add eggs in addition to sugar. The latter versions are sometimes anglicized as "coconut custard" to distinguish them from the version without eggs. Coconut jam and coconut custard have a thicker jam-like consistency and are used as ingredients or fillings in various traditional desserts. Coconut milk can used in both sweet and savory dishes. In many tropical and Asian cuisines it is a traditional ingredient in curries and other dishes, including desserts. In Indonesia, coconut milk is one of the ingredients of the rice pancake serabi. It is also used in coconut rice, a widespread Southeast Asian dish of rice cooked in coconut milk which include the nasi lemak of Malaysia and the nasi uduk of Indonesia. In the Philippines, the very diverse class of dishes cooked in coconut milk are collectively known as ginataan. They can range from savory to dessert dishes. Coconut milk is also widely used to make traditional Filipino kakanin (rice cakes), including bibingka and biko, among others. In Brazil, coconut milk is mostly used in northeastern cuisine, generally with seafood stews and desserts. In Venezuela, pulp dishes are prepared with coconut milk and shredded fish in a dish called mojito en coco. In Colombia and Panama, the grated flesh of coconut and coconut milk are used to make sweet titoté. Coconut milk is used to make traditional Venezuelan dishes such as majarete, a typical Venezuelan dessert, and arroz con coco, the Venezuelan version of coconut rice. In Southeast Asia, coconut milk is used to make many traditional drinks. Cendol is a popular iced drink from this region containing chilled coconut milk and green jellies made of rice flour. Coconut milk is also used in hot drinks, such as bandrek and bajigur, two popular drinks from Indonesia. Sweetened coconut milk and coconut milk diluted with water are two popular coconut beverages in southern China and Taiwan. The jelly-like pulp from the inside of the coconut is often added to coconut water to make a tropical drink. In Brazil, for example, coconut milk is mixed with sugar and cachaça to make a cocktail called batida de côco. :183 Puerto Rico is also popular for tropical drinks containing coconut, such as piña colada and coquito, which typically contain coconut milk or coconut cream. One of the most prominent components of coconut milk is coconut oil, which many health organizations, such as the United States Food and Drug Administration, World Health Organization, International College of Nutrition, the United States Department of Health and Human Services, American Dietetic Association, American Heart Association, British National Health Service, and Dietitians of Canada, discourage people from consuming in significant amounts due to its high levels of saturated fat. Excessive coconut milk consumption can also raise blood levels of cholesterol due to the amount of lauric acid, a saturated fat that contributes to higher blood cholesterol by increasing the levels of high-density lipoprotein cholesterol. In 1943, it was discovered that coconut milk could actively encourage plant growth. Although there are many factors that attribute coconut milk to plant growth, the main cause is the existence of a cytokinin known as zeatin found in coconut milk. While the zeatin in coconut milk speeds up plant growth in general, it does not speed up growth in certain plants such as radishes. :8 However, when 10% coconut milk is added to the substrate in which wheat is grown, substantial improvements have been noted. ^ a b c d "Coconut milk" (PDF). Philippine Coconut Authority. 2014. Retrieved 22 September 2016. ^ a b c d e f g h i NIIR Board of Consultants and Engineers (2006). The Complete Book on Coconut & Coconut Products (Cultivation and Processing). Asia Pacific Business Press Inc. p. 274. ISBN 9788178330075. ^ a b c d e f g Tetra Pak (2016). "The Chemistry of Coconut Milk and Cream". Coconut Handbook. Tetra Pak International S.A. ISBN 9789177739487. ^ a b c d e Lewis, Susana; Lewis, Charles (2012). A Taste of Paradise. Psy Press. p. 18. ISBN 9781938318009. ^ a b Bridges, Meagan (2018). "Moo-ove Over, Cow's Milk:The Rise of Plant-Based Dairy Alternatives". In Carol Rees, Parrish. Practical Gastroenterology (PDF). Nutrition Issues in Gastroenterology, Series #171. pp. 20–27. ^ "Coconut milk, cream, and sweetened cream". ochef.com. ^ a b "Coconut milk, raw (liquid expressed from grated meat and water) per 100 g". Nutritiondata.com by Conde Nast; republished from the USDA National Nutrient Database, version SR-21. 2014. Retrieved 13 May 2016. ^ Henni S (13 September 2010). "Coconut water". American Society for Nutrition. Retrieved 6 March 2017. ^ Tetra Pak (2016). "Coconut Food Production". Coconut Handbook. Tetra Pak International S.A. ISBN 9789177739487. ^ a b c d e f g Solomon, Charmaine (2014). The Complete Asian Cookbook: Indonesia, Malaysia & Singapore. Hardie Grant Books. ISBN 9781743581704. ^ a b Birosel, D. M.; Gonzales, Antonia L.; Santos, Milagros P. (1963). "The nature and properties of the emulsifier system of oil globules in coconut milk and cream" (PDF). The Philippine Journal of Science. 92 (1): 1–15. ^ Kurian, Alice; Peter, K.V. (2007). Commercial Crops Technology. New India Publishing. pp. 202–203. ISBN 9788189422523. ^ a b Grimwood, Brian E. (1975). Coconut Palm Products: Their Processing in Developing Countries. Food & Agriculture Organization. pp. 183–187. ISBN 9789251008539. ^ a b Iddison, Phil. "Katai: Coconut Scrapers" (PDF). Oxford Symposium on Food & Cookery. ^ a b Kirch, Patrick Vinton; Green, Roger C. (2001). Hawaiki, Ancestral Polynesia: An Essay in Historical Anthropology. Cambridge University Press. p. 152. ISBN 9780521788793. ^ Kirch, Patrick V. (2010). "Controlled Comparison and Polynesian Cultural Evolution". In Diamond, Jared; Robinson, James A. Natural Experiments of History. Harvard University Press. p. 22. ISBN 9780674076723. ^ Pakkawan, Assawin. "Traditional coconut graters on show at southern funeral". Bangkok Post. Retrieved 18 April 2019. ^ Aranas, Jennifer (2012). The Filipino-American Kitchen: Traditional Recipes, Contemporary Flavors. Tuttle Publishing. ISBN 9781462904914. ^ Snodgrass, Mary Ellen (2004). Encyclopedia of Kitchen History. Routledge. p. 233. ISBN 9781135455729. ^ a b c d Philippine Coconut Authority (2014). Coconut Processing Technologies: Coconut Milk (PDF). FPDD Guide No. 2 - Series of 2014. Department of Agriculture, Republic of the Philippines. ^ Naik, Aduja; Venu, G.V. ; Prakash, Maya; Raghavarao, K.S.M.S. (21 November 2013). "Dehydration of coconut skim milk and evaluation of functional properties". CyTA - Journal of Food. 12 (3): 227–234. doi:10.1080/19476337.2013.833296. ^ Khuenpet, Krittiya; Jittanit, Weerachet; Hongha, Napat; Pairojkul, Sajja; Rainis, R.; Bin Abu Bakar, M.N. ; Ezuer Shafii, J. (6 January 2016). "UHT Skim Coconut Milk Production and Its Quality". SHS Web of Conferences. 23: 03002. doi:10.1051/shsconf/20162303002. ^ Mathew, Biju, ed. (2015). Anchor India 2015. Info Kerala. p. 252. ISBN 9788192128498. ^ Tanafranca, Daisy E. (1984). "Traditional Processed Foods and Their Processing Technologies In The Philippines". Proceedings of the International Symposium on Agricultural Product Processing and Technology: 64–77. ^ a b Capuso, S.A.; Celestino, V.G. ; Gonzales, A.L. (1981). "Studies on the isolation and functional characteristics of protein from coconut skim milk". The Philippine Journal of Science. 110 (1–2): 25–32. ^ Ghosh, D.K. (2015). "Postharvest, Product Diversification and Value Addition in Coconut". In Sharangi, Amit Baran; Datta, Suchand. Value Addition of Horticultural Crops: Recent Trends and Future Directions. Springer. p. 131. ISBN 9788132222620. ^ Davide, C.L. ; Peralta, C.N. ; Sarmago, L.G. ; Pagsuberon, G.J. (1986). "A new technology for blue cheese production from coconut milk skimmilk powder blends". Philippine Journal of Coconut Studies. 11 (2): 51–58. ^ Davide, Clara L.; Reforma, Cleofe P.; Sarmago, Ione G.; Pagsuberon, Giselle J.; Fuentes, Portia A. (1991). "Composition, sensory quality, and acceptability of fresh and ripened cheeses made from skimmilk powder-coconut milk blends". NRCP Research Bulletin. 42 (1–4): 288–318. ^ Ocansey, Alfred Kabutey (2010). Development of Cheese Product from Coconut Milk (PDF) (MSc). Kwame Nkrumah University of Science and Technology. ^ a b Sanchez, Priscilla C. (2008). Philippine Fermented Foods: Principles and Technology. University of the Philippines Press. p. 301. ISBN 9789715425544. ^ Shurtleff, William; Aoyagi, Akiko (2013). History of Soymilk and Other Non-Dairy Milks (1226-2013): Including Infant Formulas, Calf Milk Replacers, Soy Creamers, Soy Shakes, Soy Smoothies, Almond Milk, Coconut Milk, Peanut Milk, Rice Milk, Sesame Milk, etc. Soyinfo Center. p. 1461. ISBN 9781928914587. ^ Escueta, Elias E.; Bourne, Malcolm C.; Hood, Lamartine F. (July 1985). "Effect of Coconut Cream Addition to Soymilk on the Composition, Texture, and Sensory Properties of Tofu". Journal of Food Science. 50 (4): 887–890. doi:10.1111/j.1365-2621.1985.tb12973.x. ^ "What is Cream of Coconut and How to Use It". Baking Bites. Retrieved 18 April 2019. ^ "Cream of coconut". Gourmet Sleuth. Retrieved 18 April 2019. ^ O'Neil, Darcy. "Cream of Coconut Recipe". Art of Drink. Retrieved 18 April 2019. ^ "Philippine quarterly of culture and society". 32. University of San Carlos. 2004: 31. ^ Thampan, Palakasseril Kumaran (1981). Handbook on Coconut Palm. Oxford & IBH. p. 199. ^ a b Pradeepkumar, T.; Jyothibhaskar, B. Suma; Satheesan, K.N. (2008). Management of Horticultural Crops Part II. New India Publishing. pp. 572–573. ISBN 9788189422493. ^ Duruz, Jean; Khoo, Gaik Cheng (2014). Eating Together: Food, Space, and Identity in Malaysia and Singapore. Rowman & Littlefield. p. 45. ISBN 9781442227415. ^ Alford, Jeffrey; Duguid, Naomi (2000). Hot Sour Salty Sweet: A Culinary Journey Through Southeast Asia. Artisan Books. p. 302. ISBN 9781579655648. ^ Myke Sarthou (2014). Angelo Comsti, ed. The Filipino Family Cookbook: Recipes and Stories From Our Home Kitchen. Marshall Cavendish International Asia Pte Ltd. p. 92. ISBN 9789814634946. ^ IBP, ed. (2007). Philippines Country Study Guide. International Business Publications. p. 112. ISBN 9781433039706. ^ Linda Civitello (2007). Cuisine and Culture: A History of Food and People. John Wiley & Sons. p. 240. ISBN 9780471741725. ^ Rexach, Nilda L. (1995), The Hispanic Cookbook (in English and Spanish), New York, NY, United States: Citadel Press, ISBN 9780806516011, retrieved 8 September 2012, In New York, many New Yorkers use 12 yolks, canned coconut milk, condensed milk, and no salt, and use 1.51 proof rum. ^ Singh RB, Mori H, Chen J, Mendis S, Moshiri M, Zhu S, Kim SH, Sy RG, Faruqui AM (December 1996). "Recommendations for the prevention of coronary artery disease in Asians: a scientific statement of the International College of Nutrition". J Cardiovasc Risk. 3 (6): 489–494. doi:10.1097/00043798-199612000-00002. PMID 9100083. ^ "Tropical Oils". American Heart Association. Archived from the original on 2 June 2011. Retrieved 16 March 2011. ^ Mensink RP, Zock PL, Kester AD, Katan MB (May 2003). "Effects of dietary fatty acids and carbohydrates on the ratio of serum total to HDL cholesterol and on serum lipids and apolipoproteins: a meta-analysis of 60 controlled trials" (pdf). Am. J. Clin. Nutr. 77 (5): 1146–55. PMID 12716665. ^ Eyres L, Eyres MF, Chisholm A, Brown RC (2016). "Coconut oil consumption and cardiovascular risk factors in humans". Nutr Rev. 74 (4): 267–80. doi:10.1093/nutrit/nuw002. PMC 4892314. PMID 26946252.